I have this strange habit of forgetting things. Sometimes half way through a conversation I lose the trail and stare blankly trying to recollect what exactly I was talking about, feeling embarrassed. Sometimes upon bumping into people known to me, I find myself unable to recollect their names and with a huge ear to ear grin talking rather animatedly than ever I try covering that up, lamely. Many a time in a fit of excitement of sharing a story with peers, I forget about the name of things addressing sofa, pavement, refrigerator and almost everything under the sun as 'thing'. But it never happened that I am baking a cake and I forget to add the most important ingredient of all - butter. Yesterday I don't know which world I was in, I forgot, for the first time in life, to add butter to the gorgeous pack of cherry muffins I was enthusiastically baking. My one hour of hard work went down the drain because of that one slip up. At the first mouthful, I felt the coarse desiccation in the texture of the muffins striking hard on my taste bud. It is really bad when your muffins are dehydrated. Worst is I made the muffins in huge bulk to last us through the entire week on breakfast. What's more pathetic is to see my husband now dipping the muffins into a bowl of melted butter before putting into his mouth. Gross!! Anyway, those of you wondering why I am talking about my futile attempts at baking muffins when my title implies a recipe on rofu fish to be covered, I just want to say, at times the frustration over callous goof-ups feels a lot more lighter when the pain is shared. I have to confess, before trying the following dish out, I was a bit skeptic about the turnout. 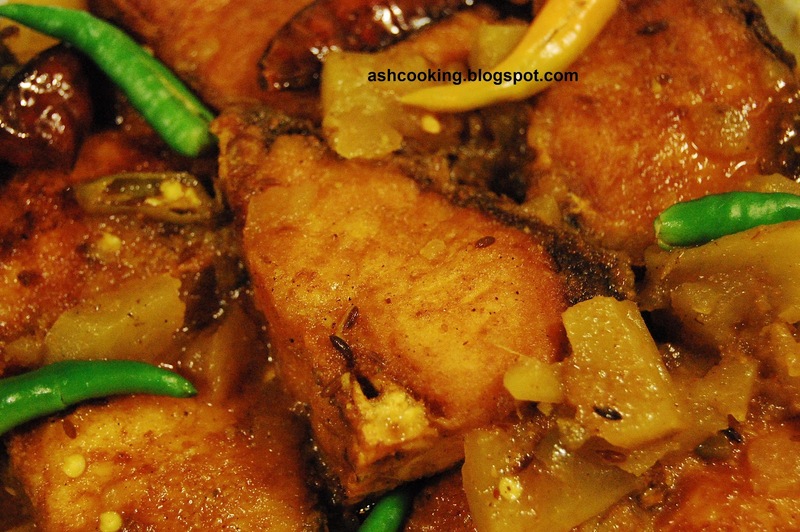 I have cooked Hilsa with Mango but never attempted the same on Rohu fish. 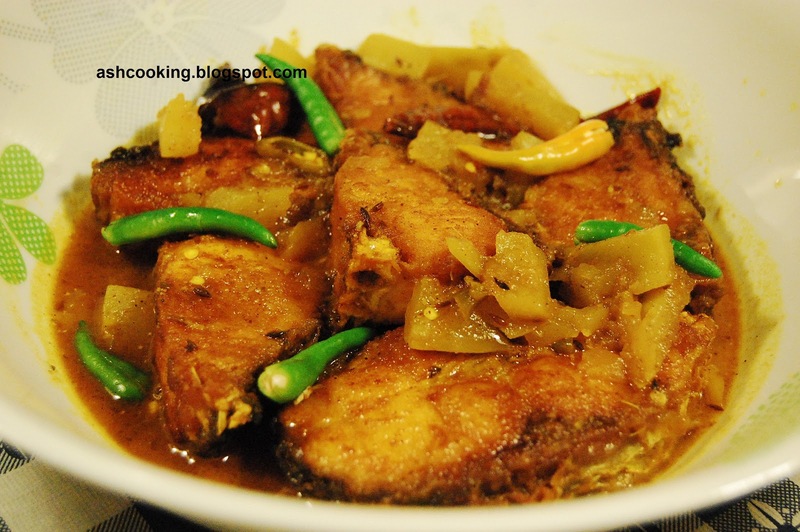 Once in Kolkata when I didn't have much wisdom about cooking, in order to find out why Cabbage is cooked with rohu head only, I embarked on an experimental venture by trying out the same with bhetki head and hilsa head, and the turnout was awful, to say the least. After the two failed attempts, I came to the logical inference - cabbage combines well with rohu head only. Period. 2) Into the same oil, add cumin seeds and dry red chillies. Allow them to crackle. 4) Add 1 cup of water and cook covered till mangoes soften. Add salt and sugar. Slide in the fried fishes and sprinkle garam masala powder on top. Cook covered for 2 minutes. 5) Garnish with green chillies. Serve hot with rice.